In our previous post, Oliver Conner analysed the number of jobseekers claiming JSA against the amount of Travel for Interview Scheme (TIS) money awarded in 2010/2011. The JSA claimants’ figures are from 2010 (source: ONS) and the TIS data (source: DWP in a response to an FOI request) covers April 2010 to around August 2011. Of course we are comparing two different types of numbers: amounts of money and total numbers of jobseekers. 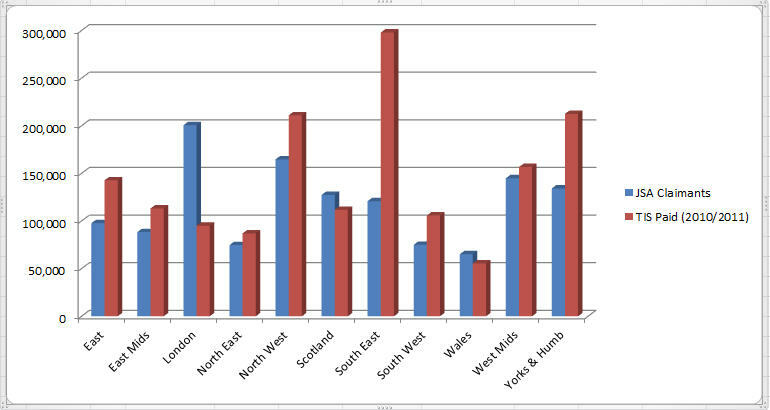 But if you take the relative national value of those figures, it gives us a good idea of the regional differences. JSA claimants vs Travel for Interview Scheme: can you map this data? Joining in our investigation on the demise of the Travel for Interview Scheme (TIS) this week, Oliver Conner researched the number of Jobseeker’s Allowance claimants around the country and compared those figures against the amount of TIS being paid out by region. His analysis reveals some interesting stats: the South East has been awarded the most amount of TIS by far, whereas the highest numbers of JSA claimants are concentrated in London. Below is a breakdown of the figures. Oliver obtained this data from the Office for National Statistics (ONS) using a tool called Nomis. Can you map this data, perhaps comparing it to poverty stats in the country? What is the co-relation between wealth, number of JSA claimants and the amount of money JobCentres spent on Travel for Interview for jobseekers? Anyone up for the challenge? Get in touch.